Hank, the lovable, grumpy red octopus in Pixar’s, Finding Dory, could escape from his tank, change color and shape, carry Dory around in a cup, and drive a truck. His real-life counterparts may not be quite as accomplished, but they are some of the most intelligent of all invertebrate life. 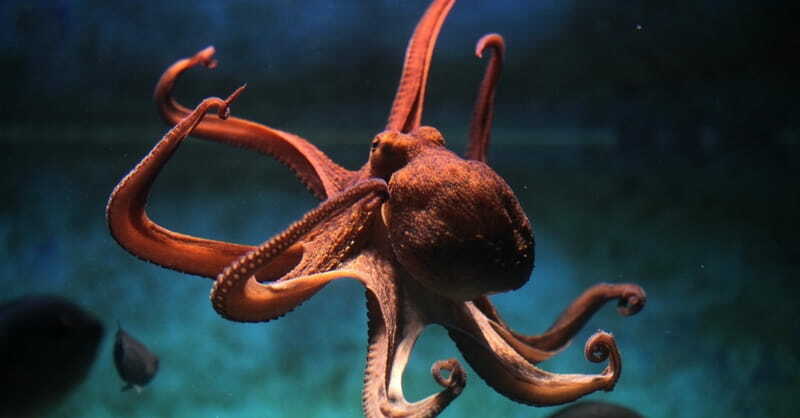 Octopuses can unlock aquarium tanks and escape, camouflage themselves by changing color and shape and can twist lids off jars to get a delicacy inside. Other sea creatures in the same group, called coleoid cephalopods, also show high levels of intelligence. Squid communicate with each other by flashing colors at varying speeds, and cuttlefish learn from visual information before they are born. If Darwin’s theory of evolution is correct, these clever sea creatures should have evolved their incredible abilities through DNA mutations. But evolutionary researchers at the Marine Biological Laboratory in Massachusetts and Tel Aviv University were shocked to discover RNA edits in the coleoids. RNA is a messenger substance that takes the genetic instructions the DNA carries and delivers them to the protein-making machinery in cells. The study, published in the journal Cell, found numerous RNA sites that had changed, or edited themselves, in response to changes in the environment. Evolutionary theory claims organisms evolve and adapt through blind, chance mutations that take place in the DNA. Eventually, through the process of natural selection, those without advantageous mutations die out. The study found the coleoids were not adapting to the environment through random DNA mutations but through RNA edits. The instructions the RNA delivered to protein-making cells was different than the instructions in the DNA. Where RNA editing sites were numerous, the blind and random DNA mutations predicted in Darwinian theory were greatly depleted, indicating RNA editing in the creatures superseded DNA mutations. The editing sites were especially numerous in the coleoids’ nervous systems and brains, suggesting RNA editing likely was responsible for their high level of behavioral sophistication. Although vertebrates and humans also have the capacity to edit RNA, it happens very infrequently. Only a fraction of 1 percent of proteins are edited in humans and the edits often don’t persist over time. But, “with these cephalopods … most of the proteins are being edited,” Eli Eisenberg a biophysicist at Tel Aviv University in Israel, said in a statement. There must be some type of signaling system, he explained, that tells the RNA when and where to perform its editing. But from a Darwinian perspective, that signaling system could only have evolved through an extreme number of DNA mutations. Also, most of the potential editing sites would not be useful for adaptation, they might be neutral or they might even be harmful. The process would need to try out each possible editing site, but there are thousands of them. And, in order for the creature to adapt, multiple sites would need to work together—an astronomically difficult task, Hunter said.